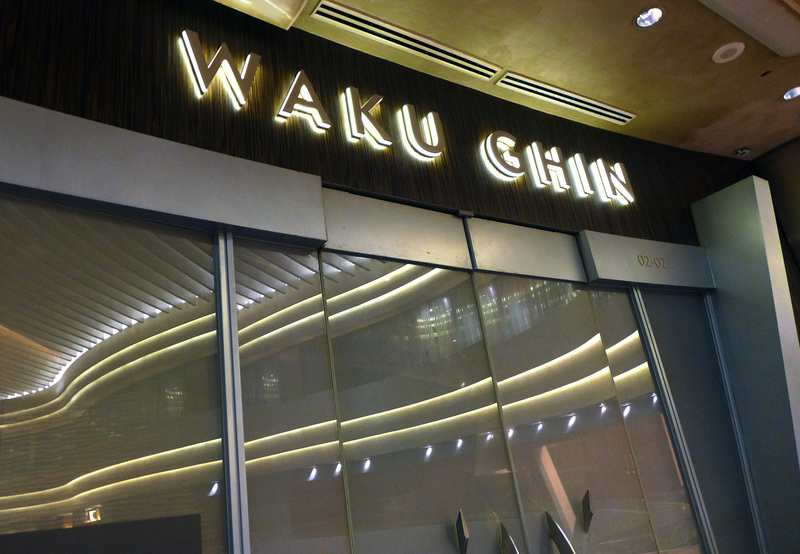 WAKU GHIN – Singapore , A long journey to eat dinner. 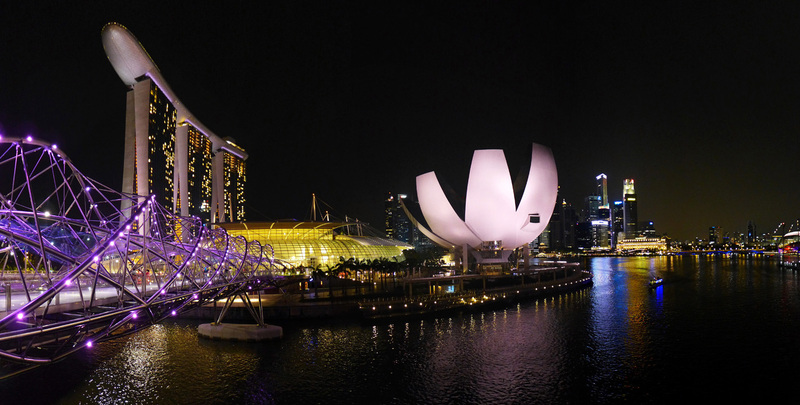 Restaurant Waku Ghin , Number 7 on the list of Asia`s best restaurants , Number 50 in the World 2014 and the Singapore base of Japanese chef Tetsuya Wakuda, a bit of a shining star of Japanese cuisine and media. 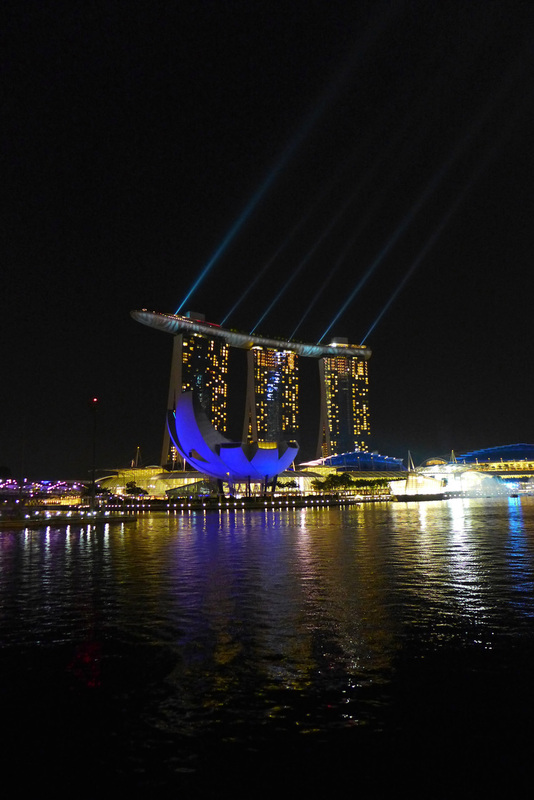 The only reason I went to Singapore was to eat here so i was expecting big things and to be honest the `Meal of a lifetime`.The restaurant is situated within Singapore`s Marina Bay Sands hotel which nowadays is the country`s most identifiable landmark…..think of Singapore and you immediately connect with the triple towers and the swimming pool table top. 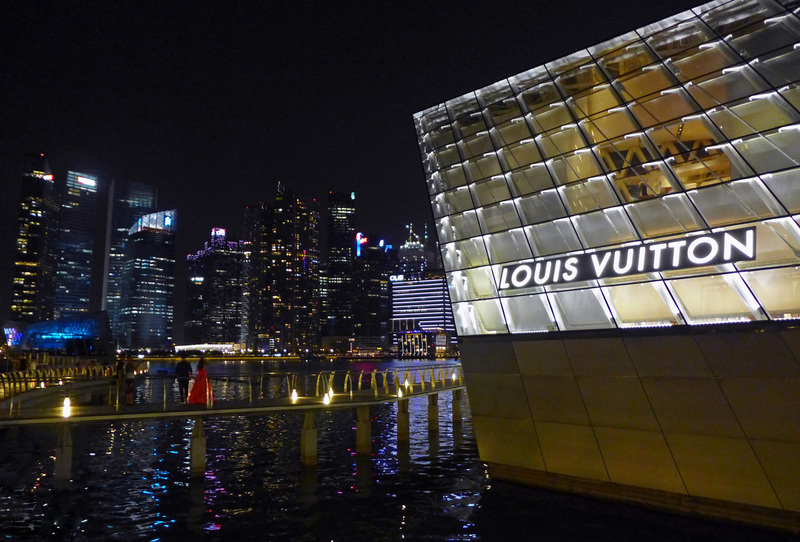 The cost of this complex was “8 Billion” Singapore dollars. 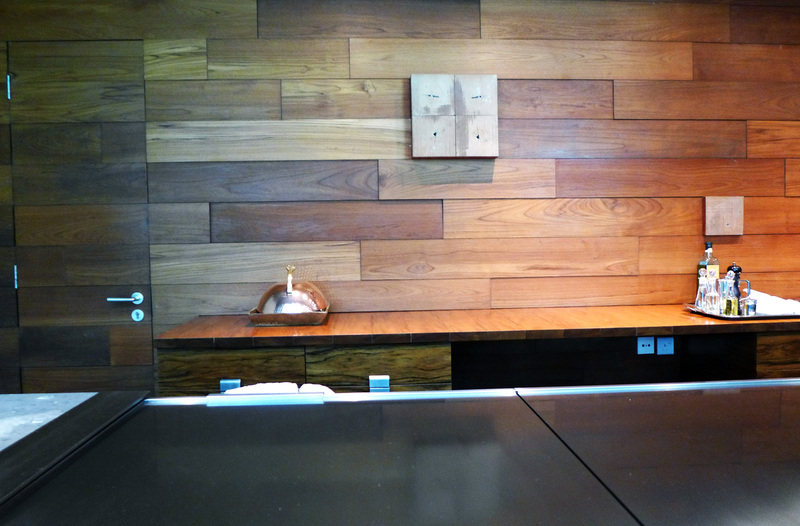 The restaurant itself is a bit of a strange place to get to so allow plenty of time if you`re going. 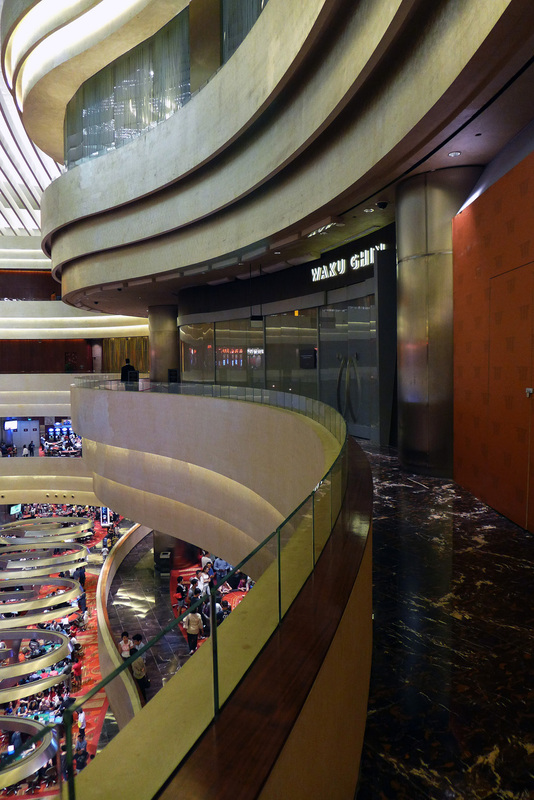 Its on the first floor above the huge casino. 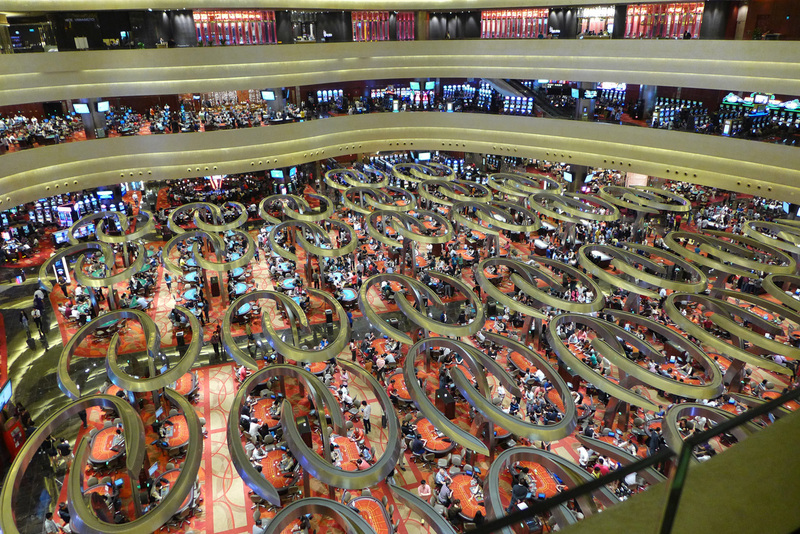 I tried to get in via the casino but was politely turned away as i didn`t have my passport. 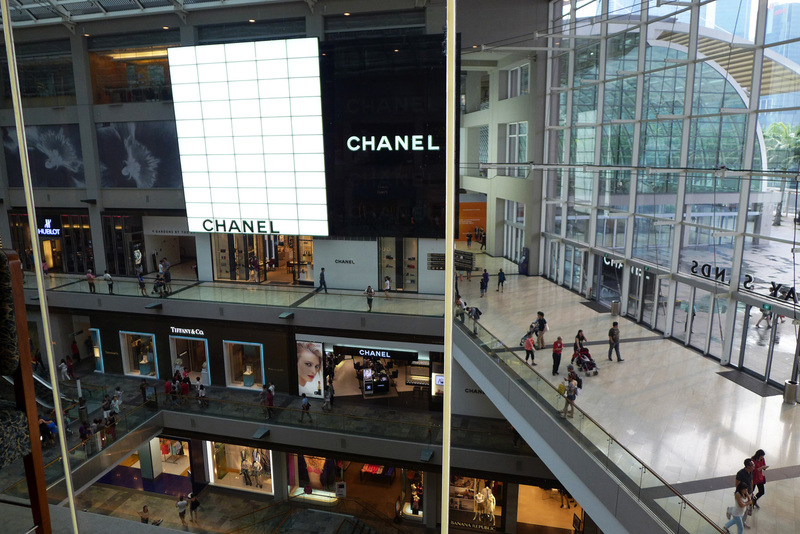 I was sent through the exclusive shopping mall , up a lift and onto a totally deserted floor where i had to scout around before spotting the Waku Ghin restaurant sign. 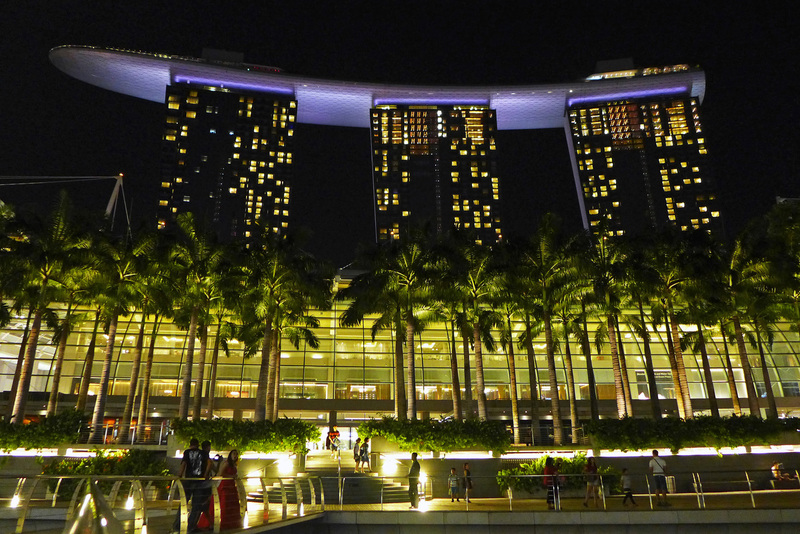 The Marina Bay Sands Casino – 1,600 Slot machines and 500 Gaming tables. When i arrived i was the only diner in the restaurant. It got a little busier throughout the evening but generally i found the atmoshpere to be a bit awkward. No music…only silence. Waku Ghin ( Spring forth and Arise / Silver ) interior is split into various small rooms, each containing a set of seats and a counter housing an immaculate griddle. The restaurant where i was dining only had 5 counter seats so that was 5 of us dining on the early sitting. The other two couples arrived shortly after i had been seated , both couples arrived and sat in silence.It was bloody awkward to say the least .I chose not to drink wine as the prices were bordering on plain silly so i went for a cold Tiger Beer at $16 (£7.60) and a bottle of mineral water at $20 (£9.50) Justify that if you can. 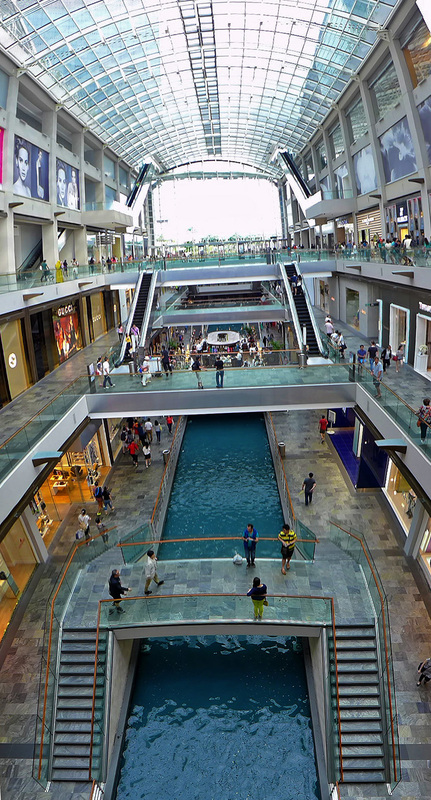 This was the view from my seat in front and behind…..So apart from the shopping mall behind me I had a nice wall to look at. 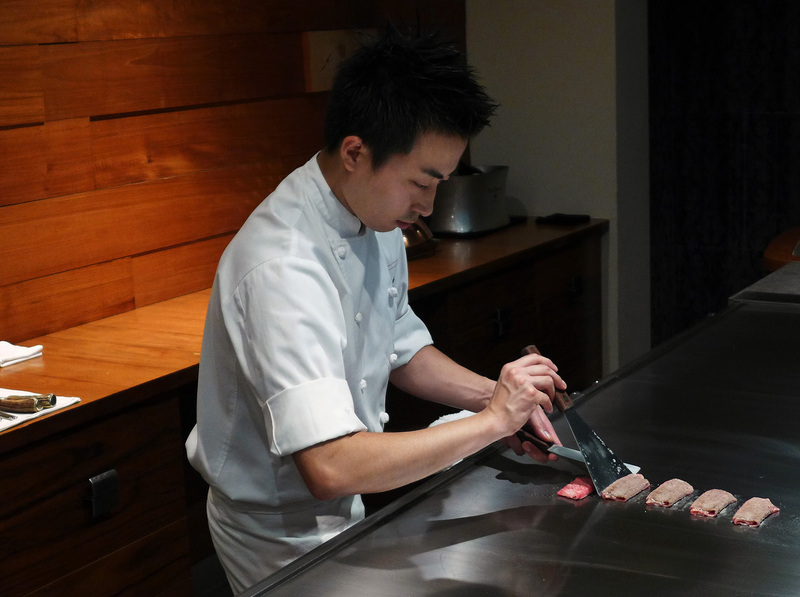 The cost of a meal at Waku Ghin is $ 400 per person ( £ 190 ). It`s as mind blowing as some of the totally ridiculous prices in the Parisienne 3 star restaurants. I tried hard to justify paying this for a meal and after considering where i was eating , the sheer expense that had gone into the project and the worlds best products flown in virtually alive and kicking then i kind of reasoned with myself what i was paying for. Alaska , Australia , Russia , Japan , Italy , Canada and Scotland….best not start discussing Carbon footprints here. Carpaccio of Halibut with Bitter leaf Salad. – Introduced by our server as ” Flounder fish ” we were given wafer thin raw slices on a lightly dressed set of salad leaves. 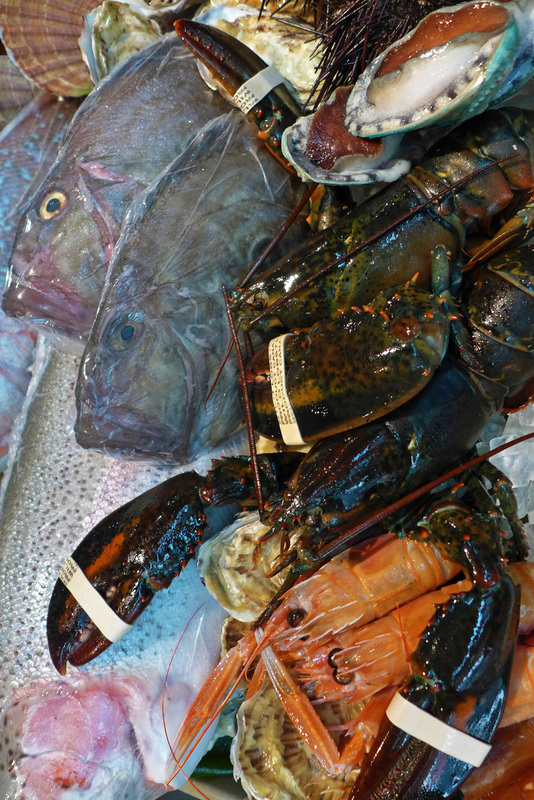 I`m not a big lover of uncooked fish so it didn`t do a lot for me. 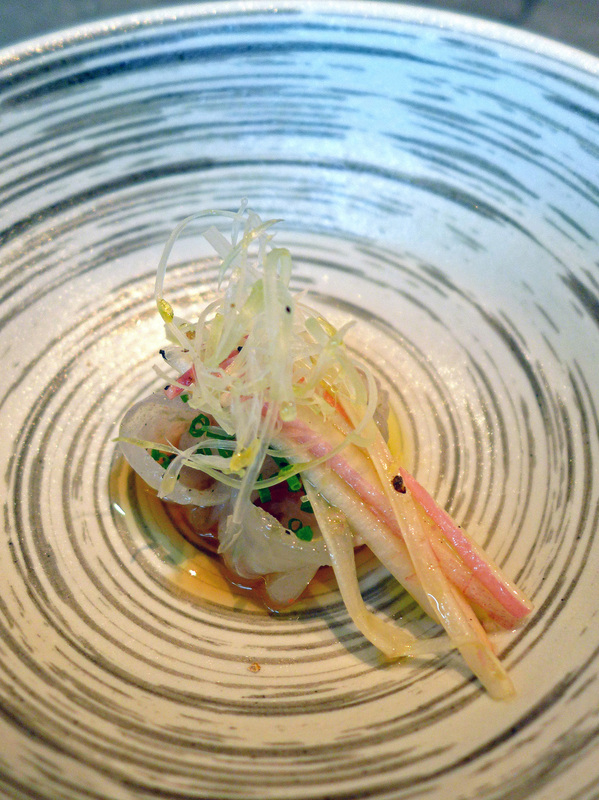 Marinated Botan Shrimp with Sea Urchin and Oscietra Caviar. 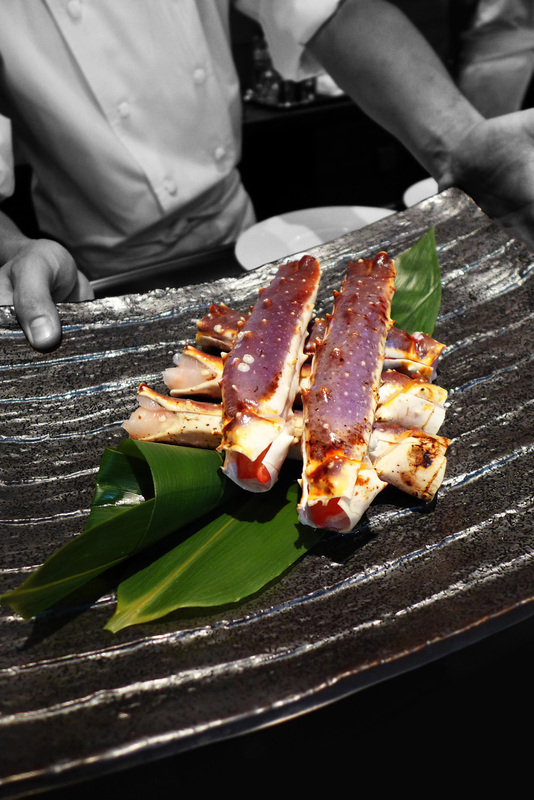 – The star of the show and Waku Ghins signature dish. 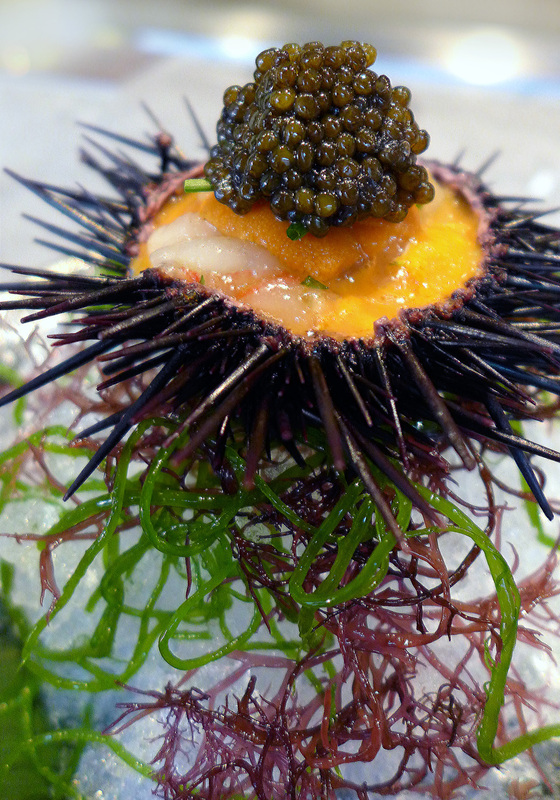 Raw sweet Shrimp and Sea Urchin topped with the finest grade Caviar. 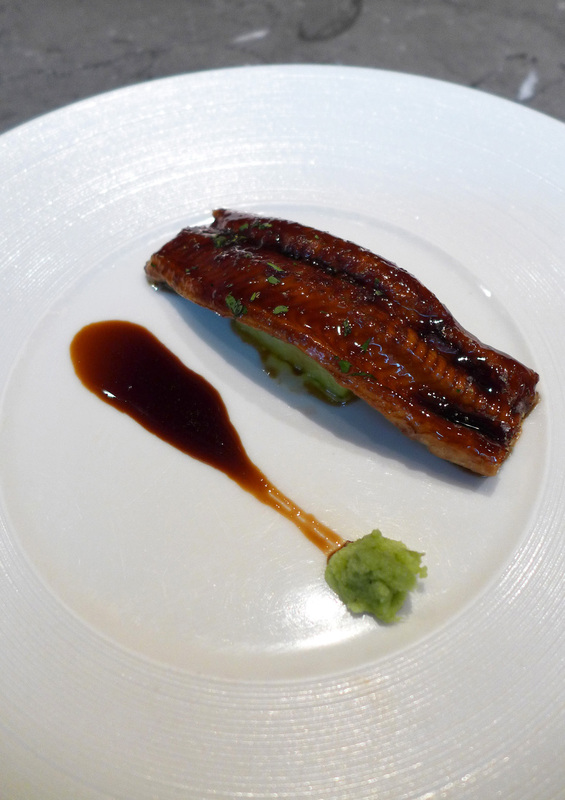 Grilled Anago with Foie Gras , Confit of Zucchini and Sanshou. – Anago is the Japanese name for a Marine Eel ( Conger eel ) . 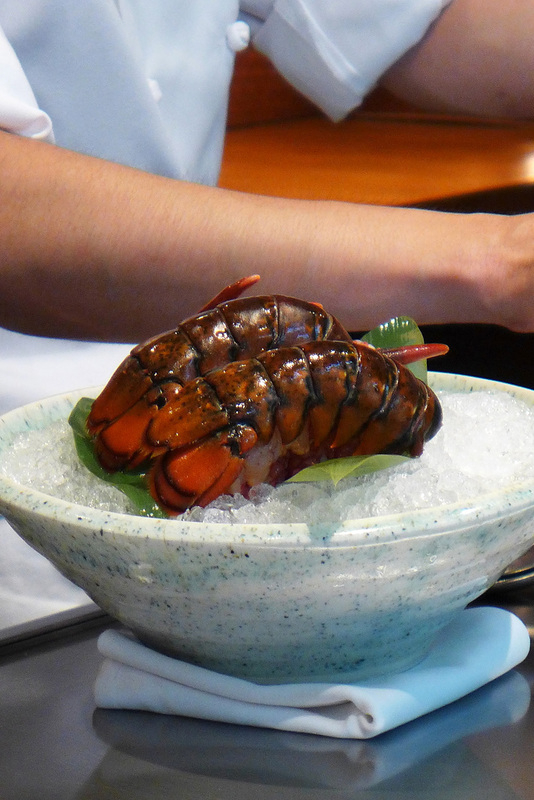 They`re widely eaten in Japan and have a really soft texture and sweet flesh. Sanshou is an essential ingredient in Japanese cooking and is the dried fruit of this Japanese Sansho Citrus tree. The fish was grilled and then sat on top of seared Foie gras. Anything that involves Foie gras is good for me so this one got the thumbs up. 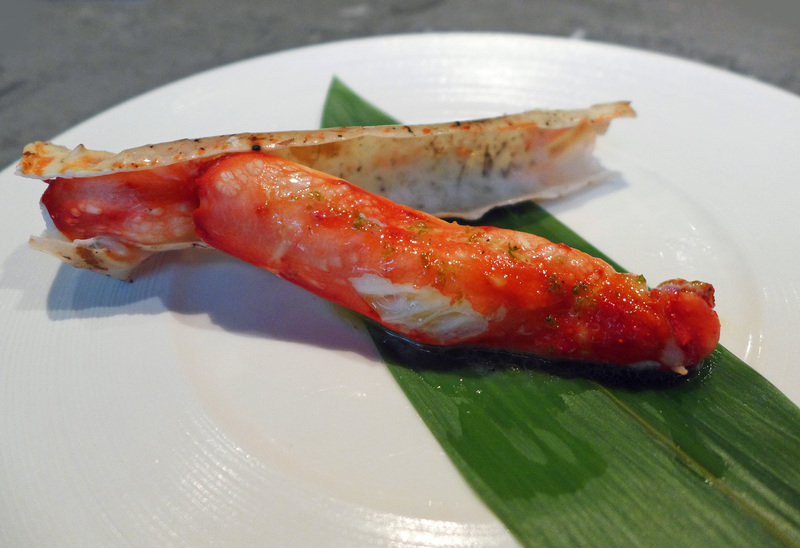 Steamed Alaskan King Crab leg with Lemon and Lime scented Extra virgin Olive Oil. 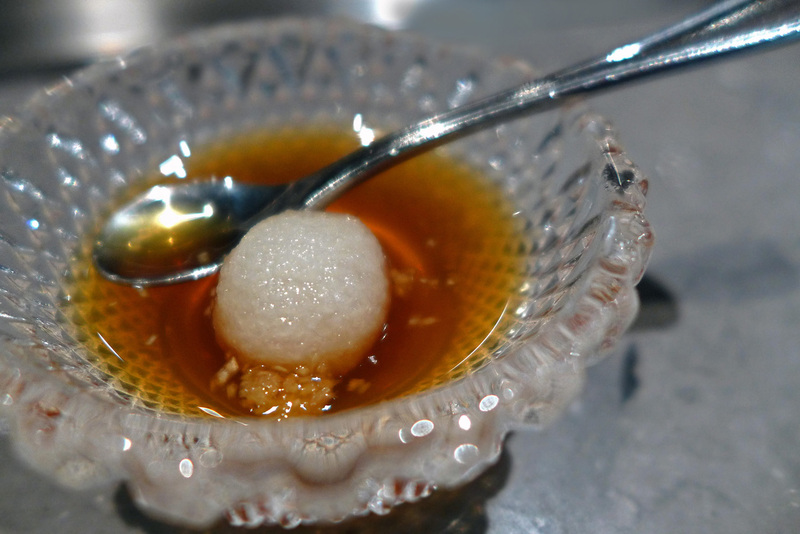 – The Crab leg was split and then steamed under a cloche on a bed of Sea Salt . 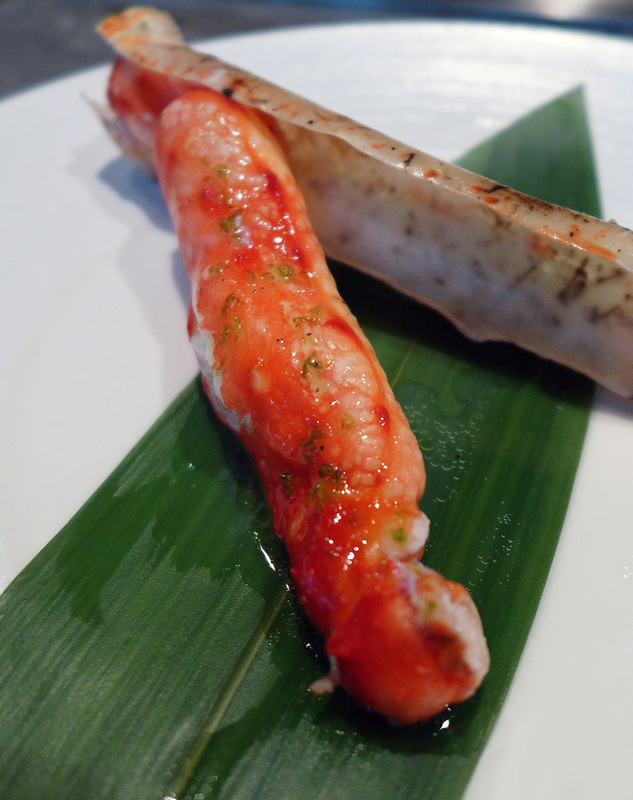 Soft , Sweet and very delicate Crab meat. 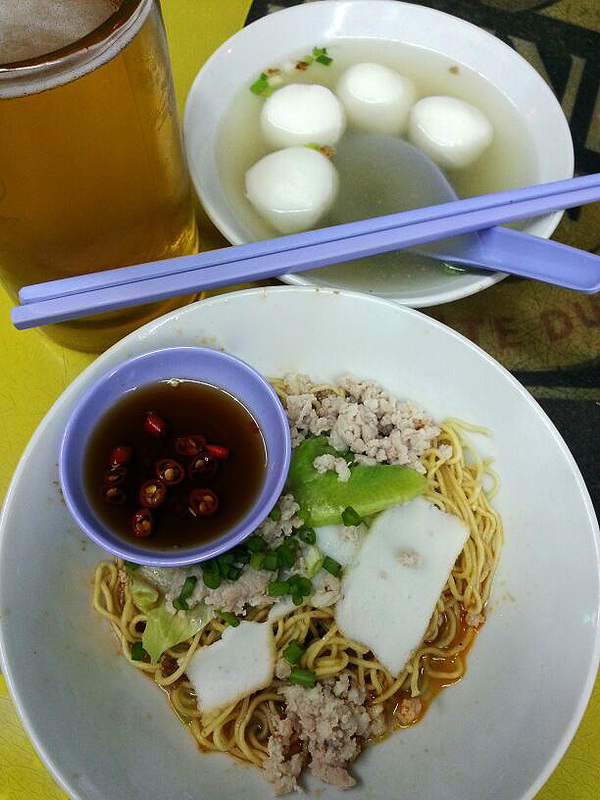 Nothing else…..Just Crab meat. 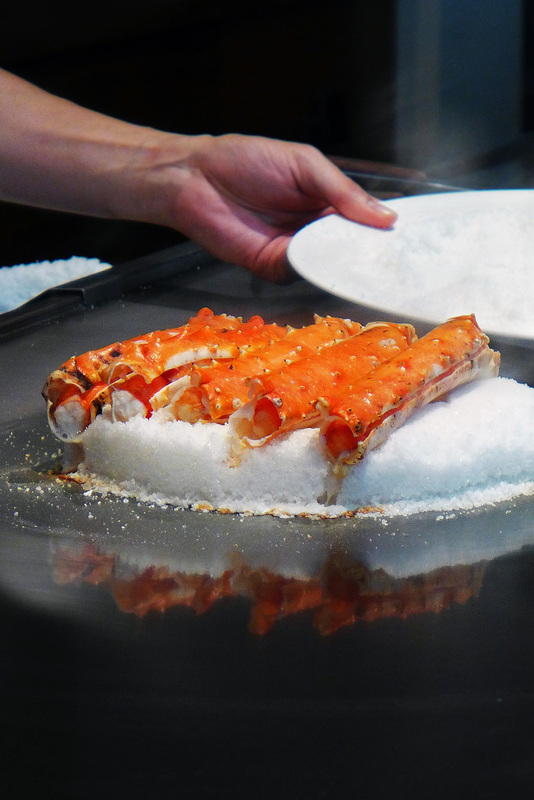 A bed of sea salt was carefully prepared on the grill.The Crab legs were then laid on to the Salt and water added to produce steam. 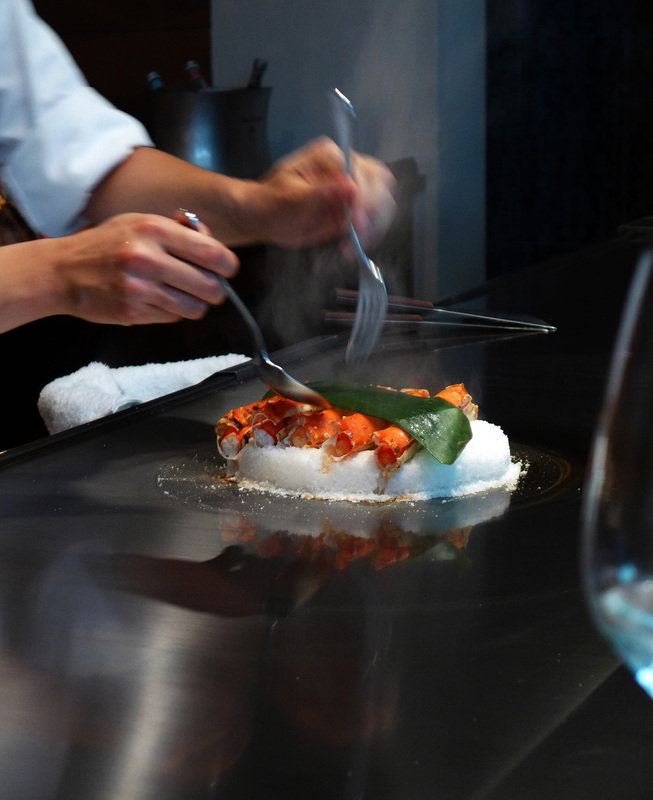 The Cloche was placed over the legs for a perfectly precise time to ensure they were cooked to perfection. 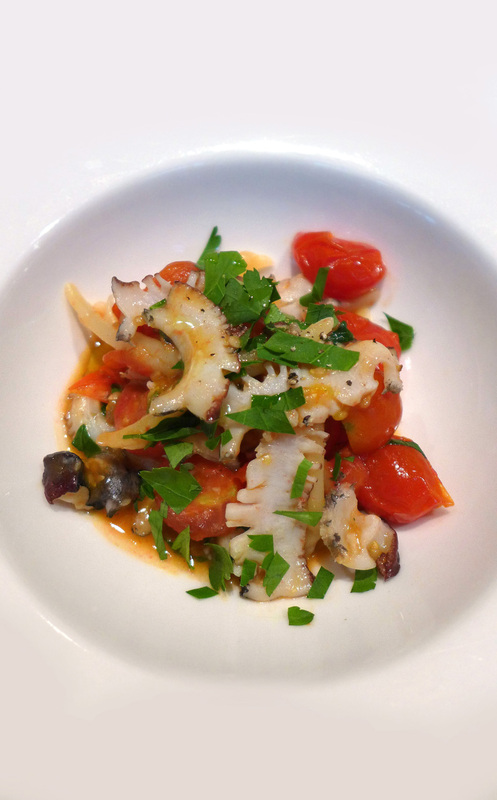 Tasmanian Abalone with Trofie and Tomatoes. – Very basic once again , “Trofie” hand rolled Pasta from Genova , Italy paired up with sweet Tomatoes and Grilled Abalone…my first eperience of this super expensive Shellfish. 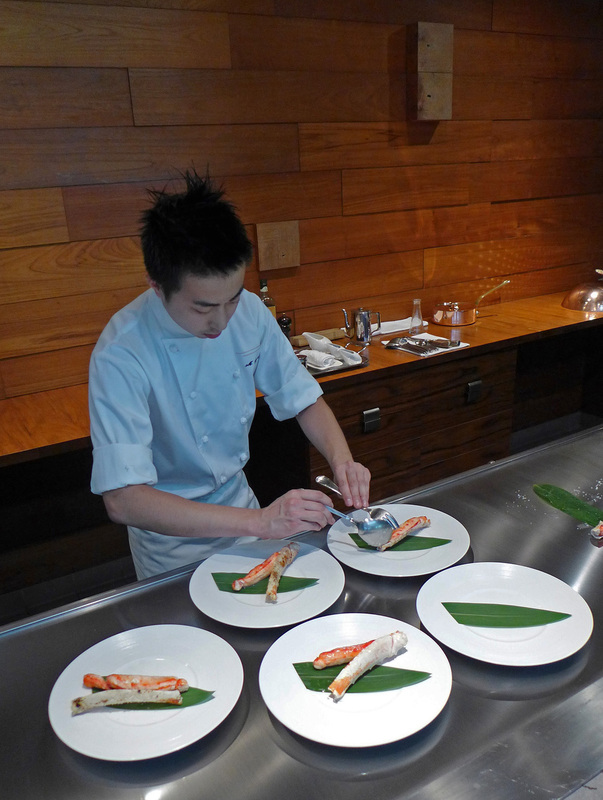 Previous meals at Waku Ghin ( as seen on youtube and various blogs ) have had the Abalone cooked at the table ( one per guest ). 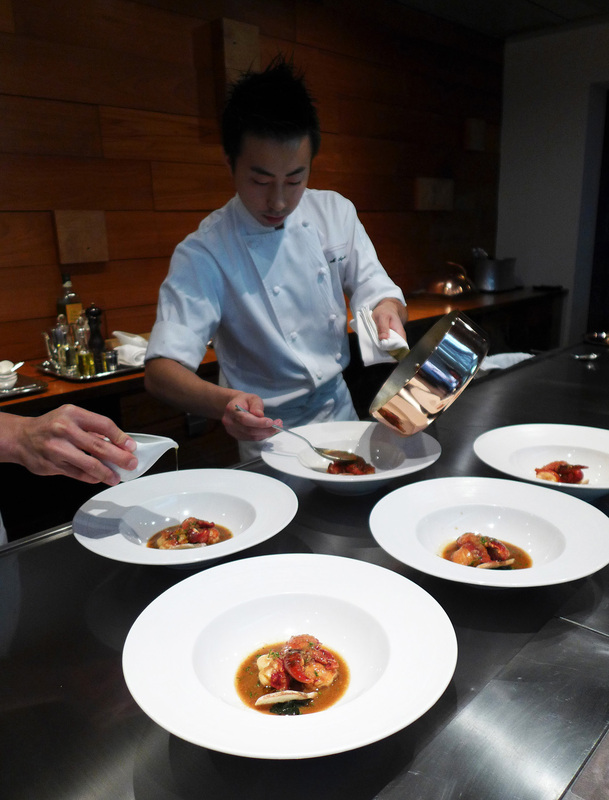 Obviously they were a bit thin on the seabed ( or cost cutting ) so this dish was prepped in the kitchens and sent out already plated up…..with a few slices each of Abalone. The Pasta was beautiful with the Tomatoes but the Abalone was merely a texture with very little flavour……disappointing. 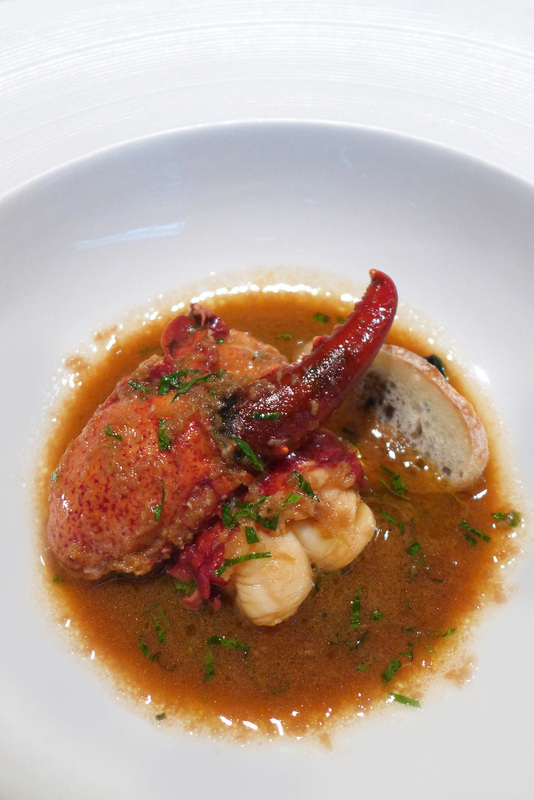 Braised Canadian Lobster with Tarragon. – Cooked in a saute pan in front of us. Perfectly cooked , sweet and very delicate flesh but the flavour of the fresh Tarragon added at the end of cooking dominated the dish totally. Ahhhhhh , Now this bit was great. 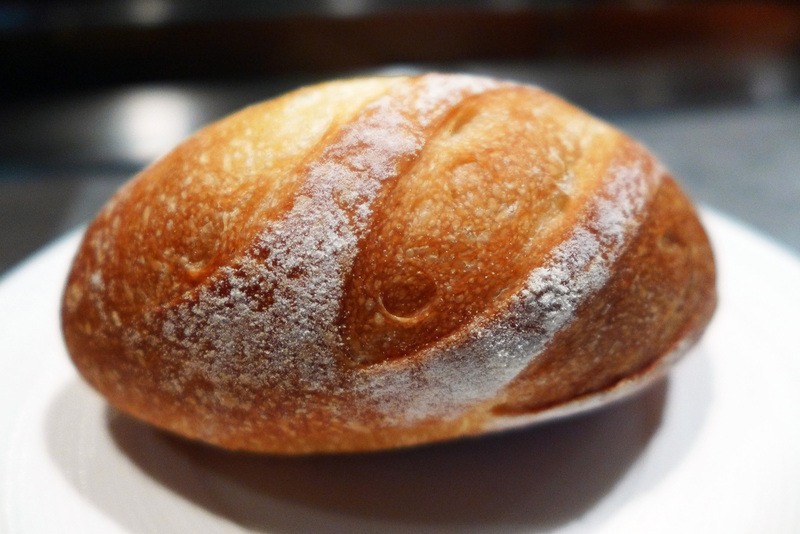 Freshly baked White Bread to mop up every bit of sauce .Totally clean plates were the satisfying result. It was at this stage of the meal that i expected to be served my Tasmanian Grass fed tenderloin of Beef course…..It never appeared. Cost cutting again ? A full main course taken off a $400 dollar menu. 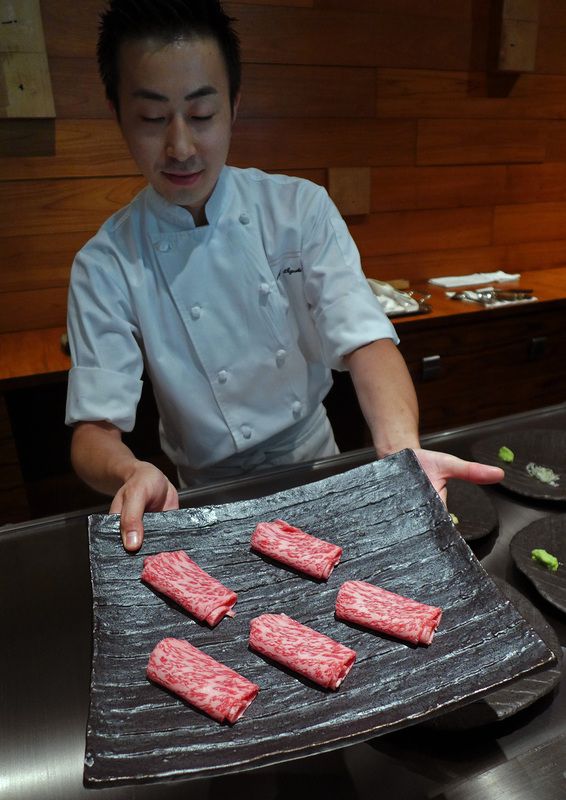 Ok , so here is my first real experince of the Worlds finest Beef , Ohmi Wagyu from Shiga prefecture in Japan….The most pampered Cows on the planet. The cost of this Beef is astronomical so surely it had to be mind blowing. I seen this on the menu in a Bangkok restaurant at £165 for a 400g steak…..One steak. The Beef is extremely rare with select farms processing very limited numbers of Cows each year. As far as the daily massages and the diet of Beer goes, this is stuff of western tales , it doesn`t happen. The beasts are fed a diet of fermented forage and live in stress free conditions in comfortable deep straw barns. The condition of the Beef is all down to the breed and the pampered lifestyle. 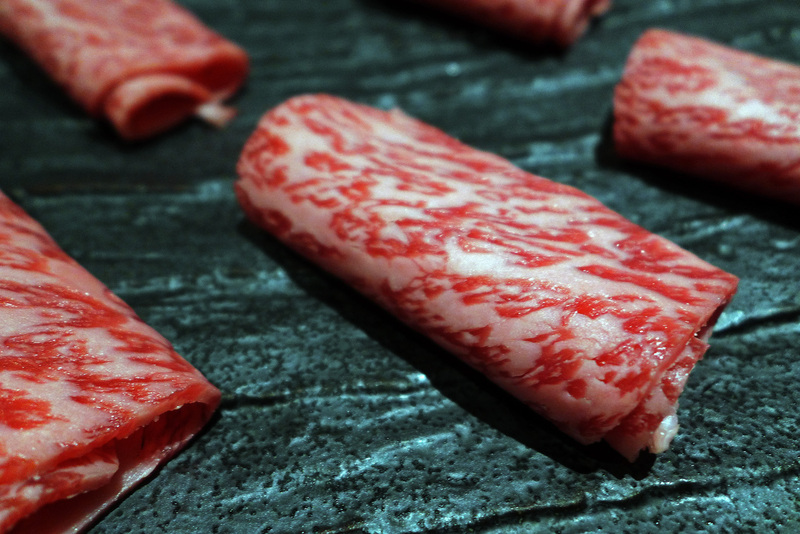 The Beef is known for its unique Marbled , ” Butter soft” teture and apparently its “incredible” taste. 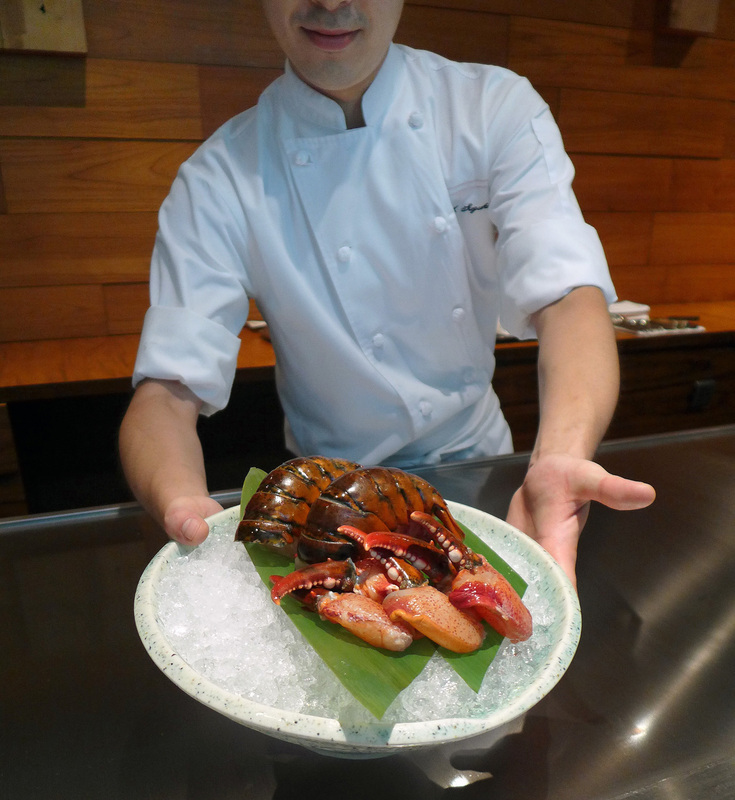 Chef informed me that it was so rich that i wouldn`t be able to eat it without its accompaniment “Wasabi”. Surely this `extreme` flavour would totally dominate and ruin the flavour of the Beef ? I was informed “Quite the opposite”. 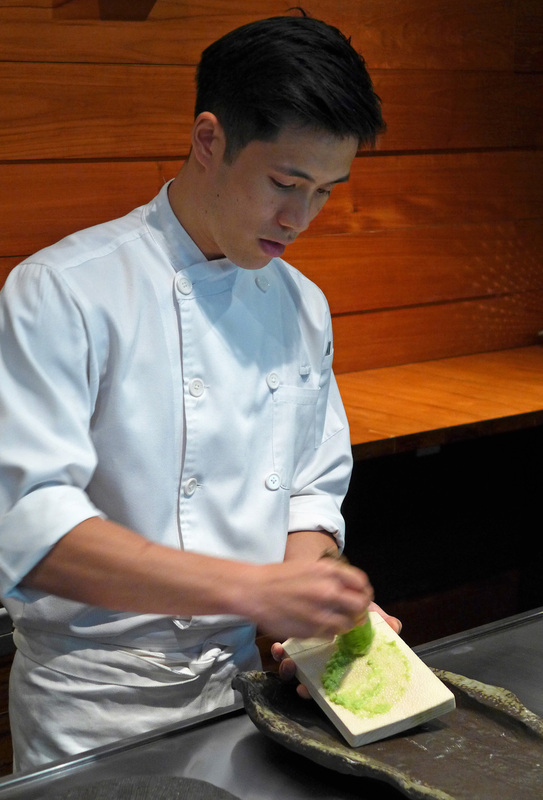 The fresh Wasabi root was grated at the table on a Sharkskin grater and Chef advised me to eat the Beef and Wasabi together to enjoy their complimentary flavours. 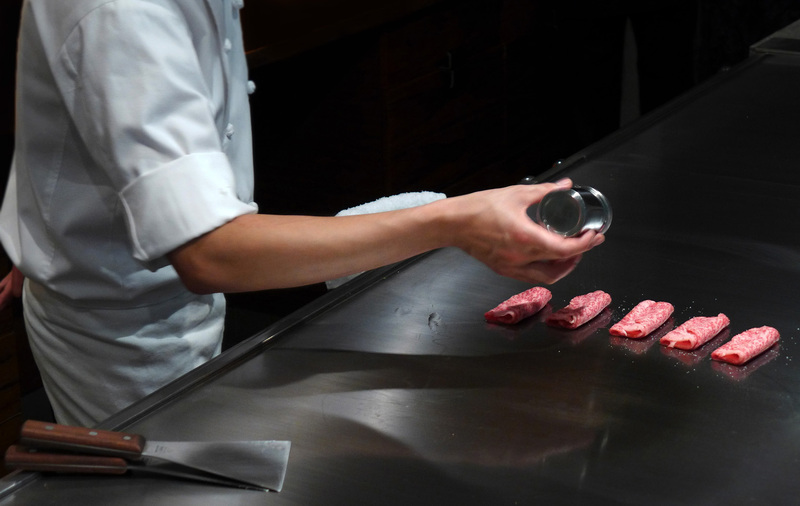 The Beef was cut into two equal pieces and i added the Wasabi as instructed…..What did i get ? “Beef and Wasabi with a mild sinus rush”. It was tender enough as it was sliced so thinly as not to be but “Ermmmm…..Excuse me but how much did you say this was” ? 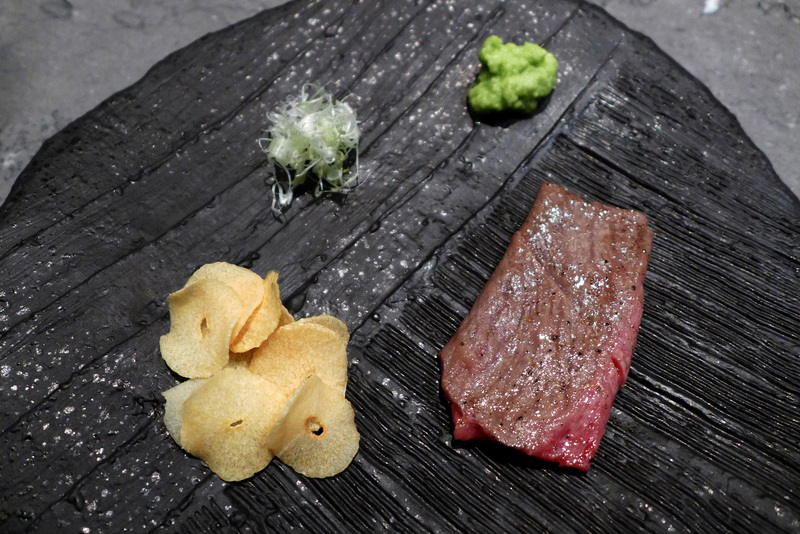 On to my second and final piece with added Garlic chips….. `Beef with Garlicky Wasabi`. 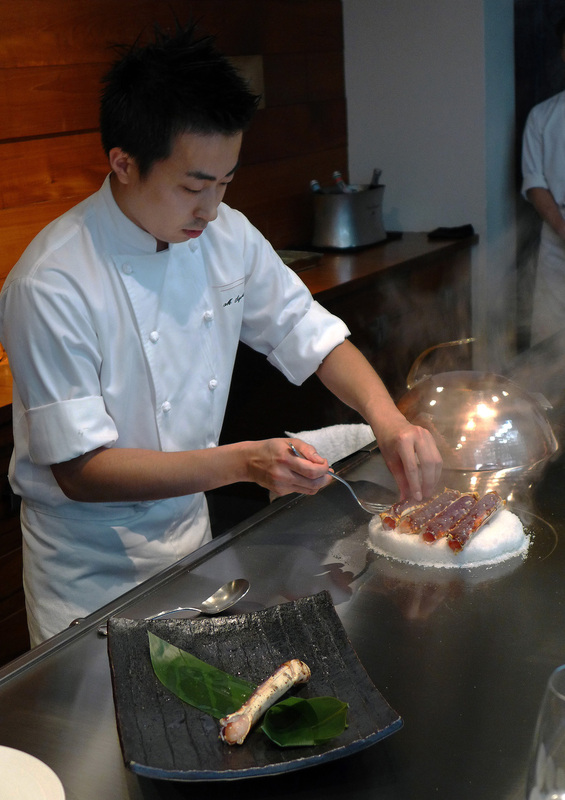 I think I`d best move on here….Not impressed.My first experience of Ohmi Wagyu , the Worlds finest Beef wasn`t a good one. Fresh Somen noodles with Myoga and Junsai. – Another first for me and probably the last as well. 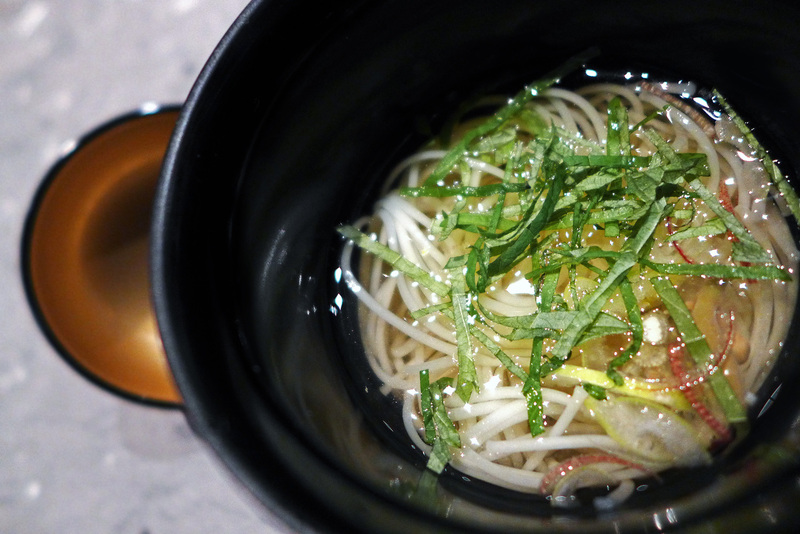 A small bowl of freshly made noodles in a cold stock containing Myoga and Junsai. Myoga being the buds of a Japanese Ginger plant whilst the Junsai can best be described as the “Mucus covered buds from the underside of Lillies. 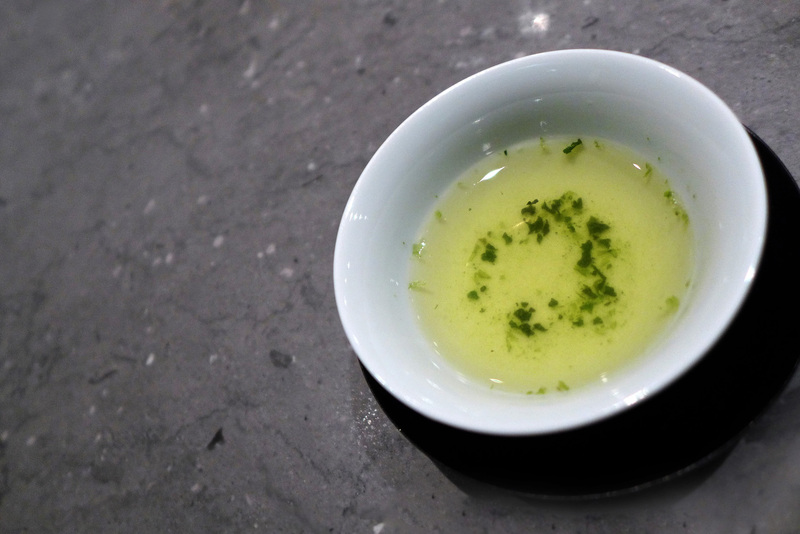 Gyokuro Green Tea – Well this is apparently the finest and most expensive of Green teas on the planet so yet again another great opportunity to try a new experience for the first ( and last ) time. The Tea is from Japan and actually grown in the shade for the last 3 weeks before harvesting. 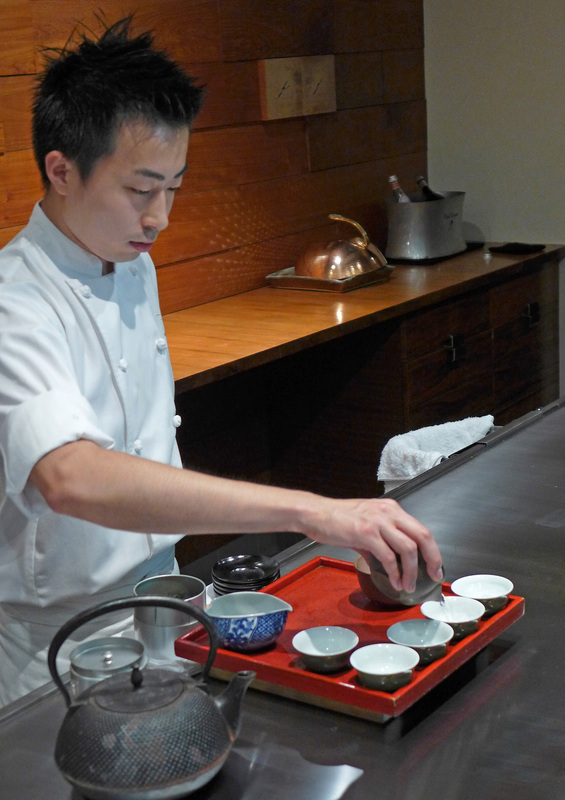 The shade causes the amino acids in the plant to increase and in turn develop a sweet flavour.After meticulous preparation , pouring and temperature testing the tea was finally poured and it was time to taste the Worlds best Green tea…..Seaweed…….it tasted of bloody Seaweed for Petes sake…. Give me a hot cup of Yorkshires finest any day of the week. 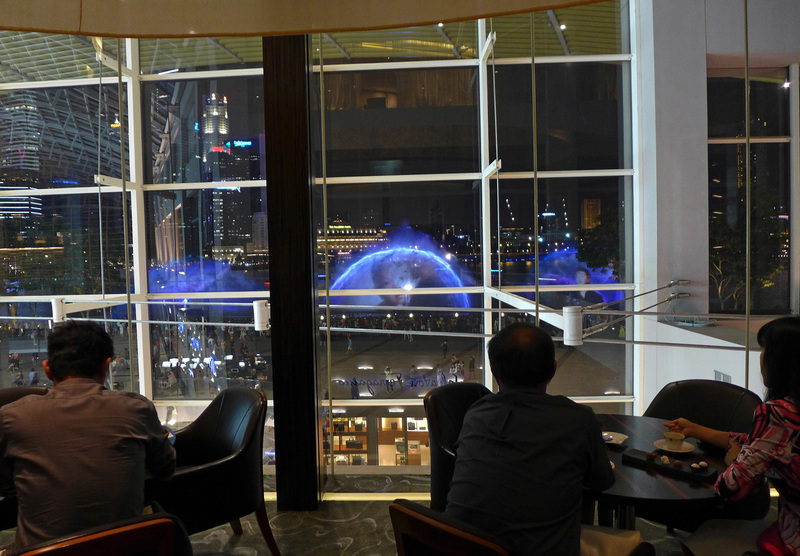 Japanese Musk Melon – At this stage of the meal i was ushered from the dining room to the lounge overlooking Marina Bay , this is where i would be served my sweet treats….always my favourite part of the meal. 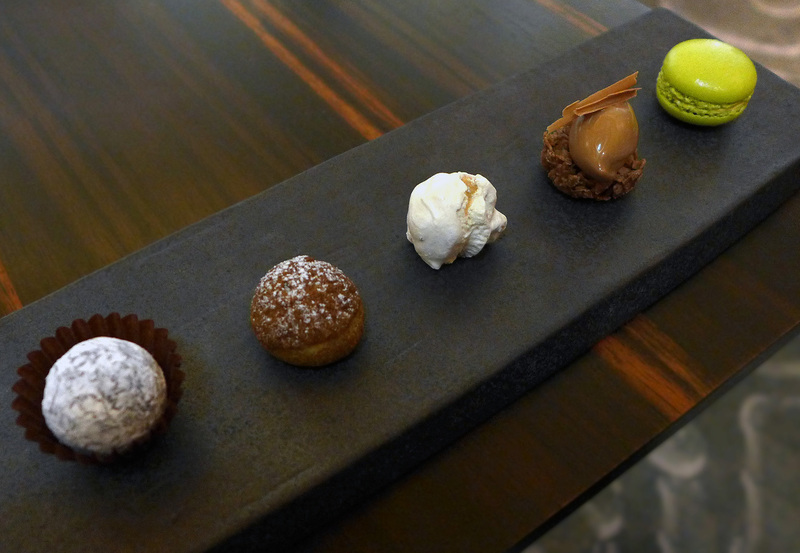 The first dessert to arrive swiftly landed in front of me…. A slice of Melon. No , I`m not joking….. A slice of Melon. Nothing like a good pastry chef on board to show off a lifetime of finely honed skills is there ?. The “Melon ” was carefully cut into little slices so i could eat it with a fork….At this point of the meal i was looking around the room to see if i was being filmed…… This has got to be a joke , surely ? 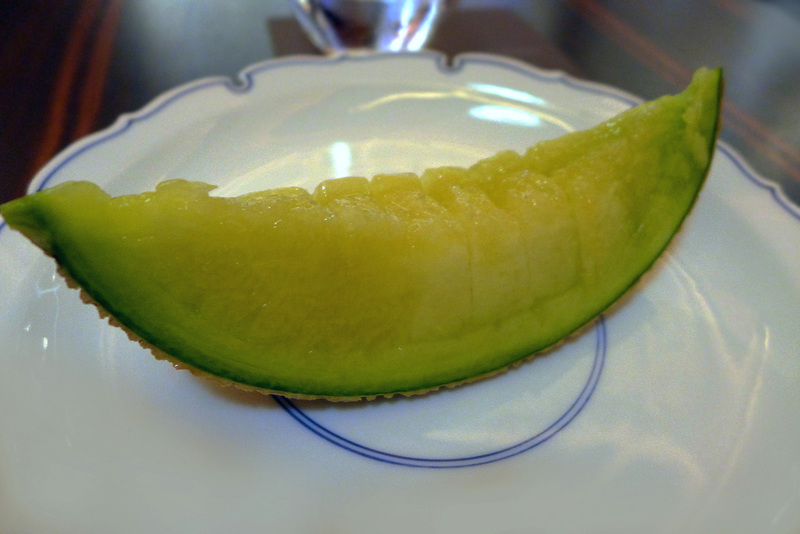 So in a nutshell i`m eating Japanese “Musk” Melon , once again a World class product. Grown by specialists with an exquisite attention to detail and care .Perfect seeds , cultivation and pruning resulting in one Melon per plant .Brushed daily by hand which in turn comes with an eye watering price tag of between 50 and 100 dollars in Japanese supermarkets. At the end of the day it was a slice of ripe , sweet Melon. I would never expect to be served this in a World class restaurant charging $ 400 dollars for a meal. 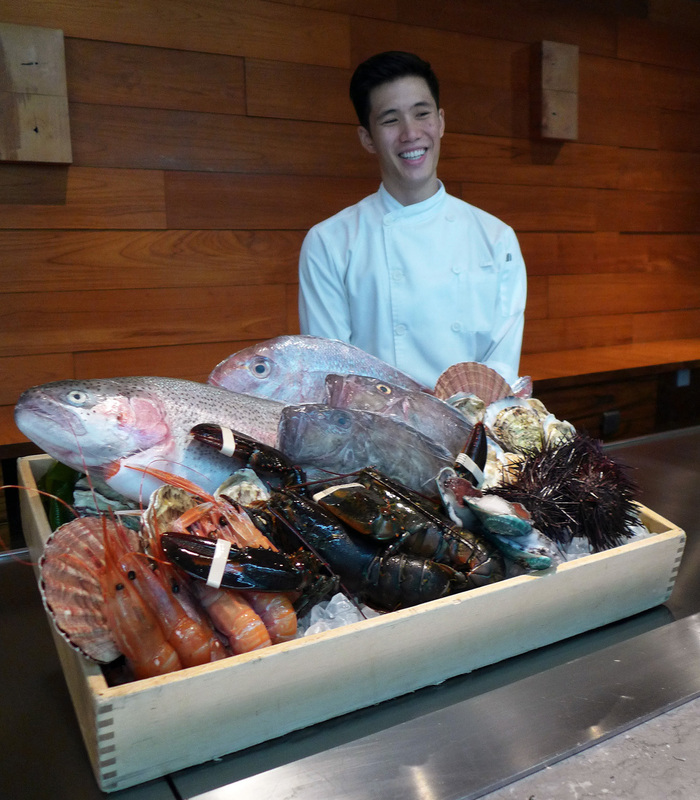 The final chapter of the menu at Waku Ghin…. The Signature ” Ghin ” Cheesecake. The dessert always putting me in a nice mood , satisfying my very sweet tooth. But on this occasion ….”Where`s the Cheesecake” ? ” you`ve got to be kidding right ” ? It was nowhere to be seen. 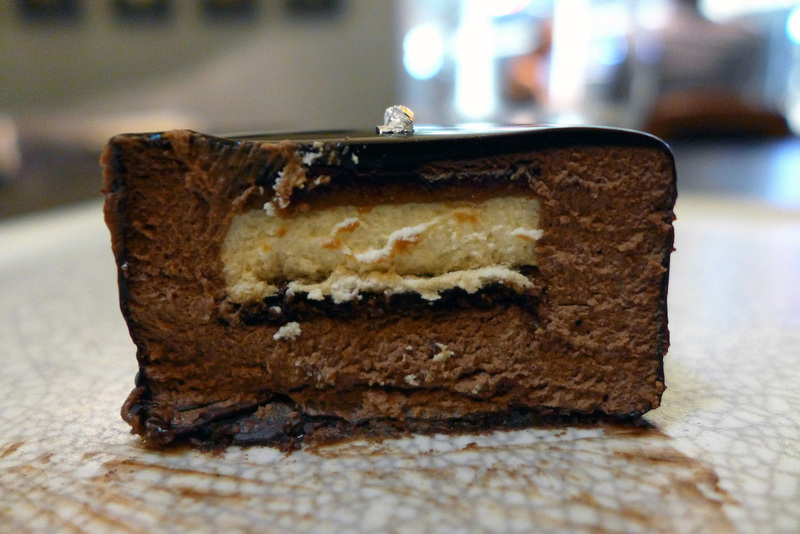 Replaced by a Chocolate Mousse cake with Vanilla and Macadamia. I left the restaurant feeling as though i`d just been kicked squarely in my Gonads . 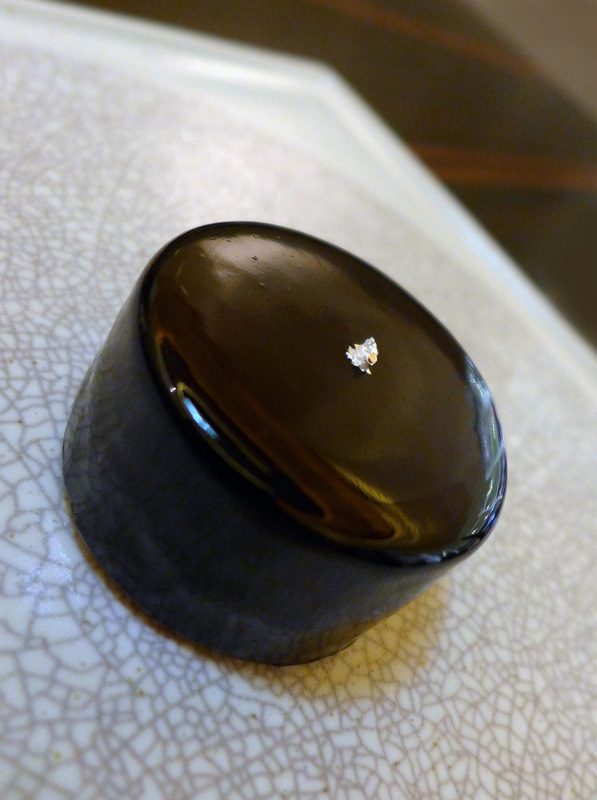 I very rarely whinge about a meal as you`ll see from my many blog posts but on this occasion i felt very differently. My Bill came in at $ 513 dollars ( £244 ) with no wine. The Tasmanian Beef course was omitted from the menu.The Abalone was “portion controlled”. 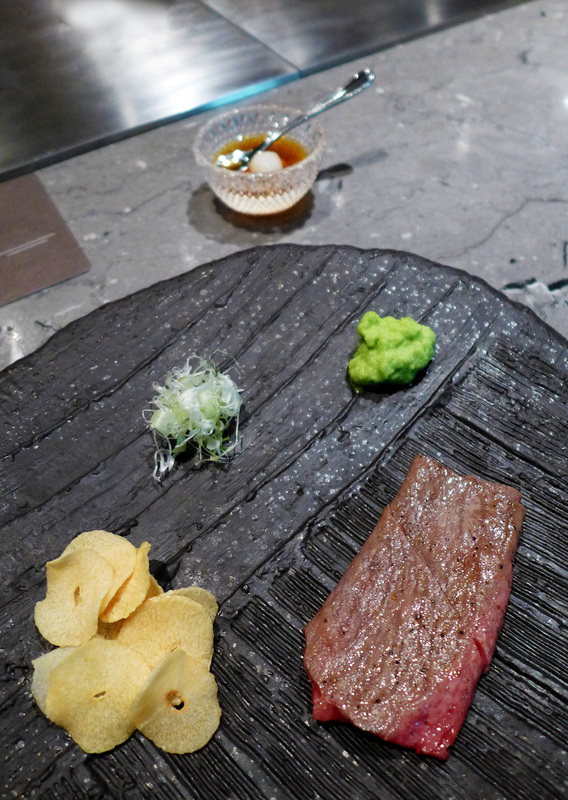 The fine flavoured Wagyu was overpowered by the fresh Wasabi.The signature Cheesecake never appeared and i was served a “slice of Melon”…….We live and learn. 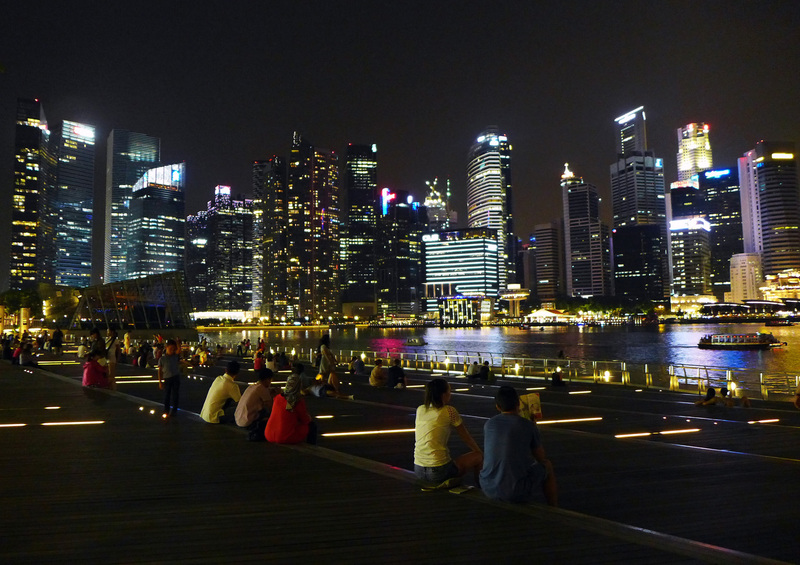 I had a relaxing stroll around the stunning Marina Bay , took aboard a few thoughts on my life and then went and spent $2 dollars on an amazing bowl of Chicken noodle soup and a stir fry in Chinatown……finally , the food hit the mark. Previous Post Koffmann – An evening of the classics. 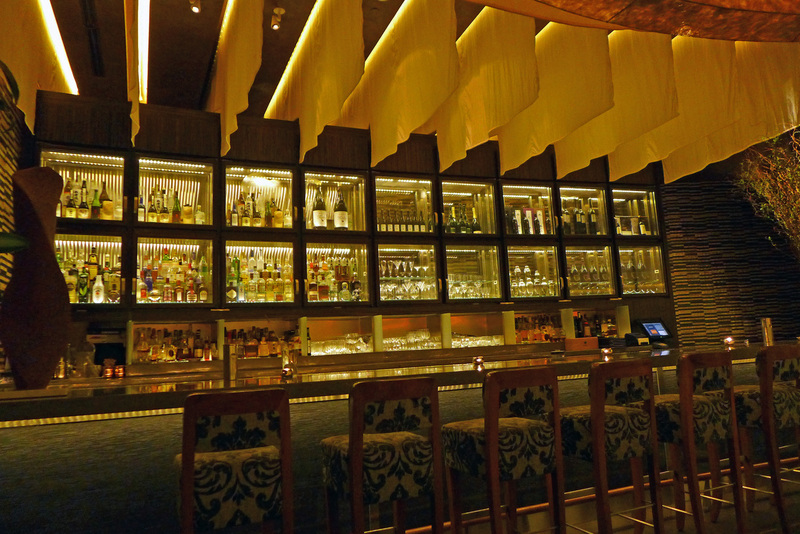 Next Post Janice Wong – 2am Dessert bar ,Singapore.